Octopus Deploy 1.4 was just released. It includes a number of bug fixes, as well as improvements to the way we call PowerShell scripts. In this release we also implemented a couple of the most popular feature requests we've had for a while. 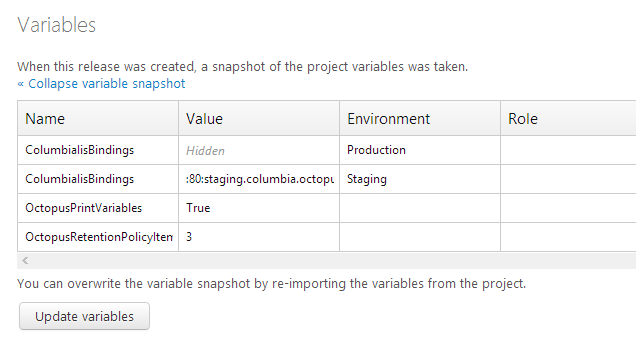 Clicking this button will re-snapshot the current project variables into the release. If you have new variables for a step that didn't exist in the release, those variables will be skipped. An audit message will also be captured to track the fact that the variables were updated, and by whom. This feature will only be supported on releases created after installing Octopus Deploy 1.4, because it required a small schema change to allow the variables to be imported. Disabled machines won't be used in deployments, nor in health checks/upgrades.